The doors to the craft show have opened,and customers are beginning to make their way down the aisle. 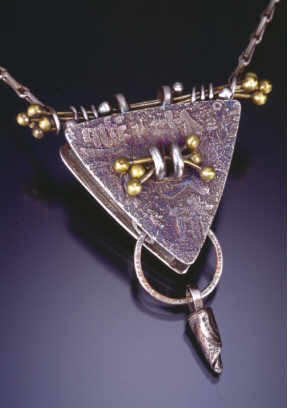 One stops at your booth to look at your PMC jewelry.”What is this?” she asks. That question looms large for many in the PMC community. Do you answer “Fine Silver” or “Precious Metal Clay”? Both are technically correct, so the question is, which will help you make the sale? Legally, any piece made exclusively from PMC can be stamped “.999 fine silver.” After firing, precious metal clay is pure silver, and requires no further explanation. (Federal law also requires that anything stamped with a fineness mark – fine silver, sterling, 24k gold, etc. &ndash; must also be stamped with are registered trademark. This law applies to any piece sold across state boundaries.) The marks maybe applied either before or after firing. Since she sells primarily through galleries, Elaine includes a hang tag with an explanation of what PMC is on one side,and an artist’s statement on the other on each piece. Other artists choose to keep the PMC aspect of their marketing more informal, labeling the pieces simply as”fine silver” and leaving the explanation of PMC to the sales patter. The danger with that excitement is that PMC will be seen as a fad. “If all you have time for is the newness [of PMC], you have to be careful. You may be getting on a slippery slope that will require you to be new again next year,” says Studio PMC Technical Editor Tim McCreight. So should you or shouldn’t you sell your pieces as PMC? The answer depends on both you and your customers. When students ask her the question, Celie says she “usually probes them a little bit about their market, and that usually gives me a little time to observe their skills at explaining themselves, and how they view their market and even a little psychology like what kind of rapport they have with their clients.” If the student has the sales skills and the opportunity to educate their clientele, Celie encourages them to market their pieces as PMC. “I think it helps everybody, including those of us who love PMC, if they go into some detail about it,” she says. But that may not be the case if the artist is several steps removed from his customers. “If you’re shipping things all over the country, and trying to decide whether in a tiny little space to put PMC or 999, I think the best answer is to stamp it 999, and then have a nice story card that explains it,” she says. All rights reserved internationally. Copyright © Studio PMC. Users have permission to download the information and share it as long as no money is made-no commercial use of this information is allowed without permission in writing from Studio PMC.